Car Parking floors are one of the most challenging jobs to do when it comes to floor application and surfacing. 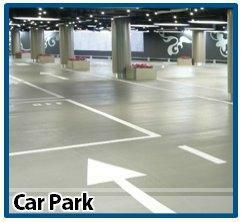 Car Park requires a high performance flooring system that is durable, anti-skid, abrasion proof, chemical resistant and can hold vehicular traffic loads for a long time. High Performance Solutions, Inc., a leading provider of industrial and commercial flooring has a new-tailored flooring system thatsuits car park spaces. Our attention to details ensures that flooring is installed perfectly and quickly. All products materials used are specifically designed to resist chemicals, machine oils and other aggressive substance.